Hi guys, Now we are looking for how can earn unlimited 3G data. For airtel users here is a chance to earn 5 Gb 3G data by completing simple tasks.Using this tricks you can earn more free internet. Now Airtel is once again comes Up with an amazing offer where you will get upto 5GB Free 3G data From Airtel. This is Airtel application offer, so guys you must have to download Airtel app.You have to just follow some steps and you will get easily free internet on airtel. Here is the steps that you must have to follow.  Now you have to Enter Your mobile number and Verify it. 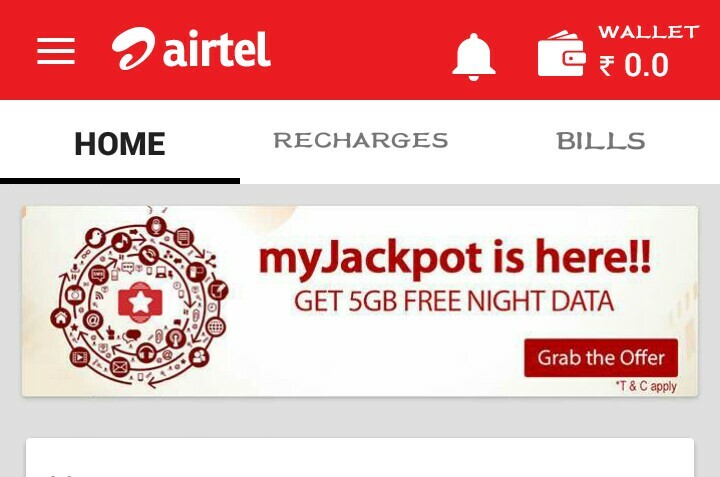  Once you are verify or login then you will see banner on Home page of Airtel app.  Now you have to complete some easy task to win free data.  You need to complete 11 steps which is need to get Airtel jackpot offer.  After completing all task you have to go back on my Airtel app and you will get redeem option. ◾Any outside of this hour the data will be deducted from users data pack. ◾Offer valid till 31st August.